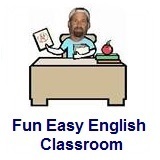 ﻿ Fun Easy English - new classroom free online classes english language lessons speaking listening writing reading january 24. 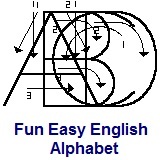 Today in the Fun Easy English classroom you are going to write the English alphabet letter A in manuscript and cursive. Writing the English alphabet letter A correctly in manuscript and cursive. A few thoughts about cursive writing. With the invention of the word processor and computers, the need for handwritten (cursive) text has been greatly reduced. Most people now use email and texting to send messages to friends. People rarely send handwritten letters anymore. Still cursive writing is important to know and a very beautiful style of writing. In America, cursive writing is used for signatures on important papers such as when buying a house or a car and for signing checks used when making purchases at stores. Conversation Lesson 24 - Yesterday Was Amazing! In this lesson Anna discovers a festival - the Smithsonian Folklife Festival on the National Mall. What does she learn there about Basque culture? Anna: Yesterday was the most amazing day. I want to tell my friend back home about it. So, I am writing her a letter! Life in Washington, D.C. is interesting. I see something new every day -- like yesterday. Yesterday started like a usual work day. Anna: I said, "Yesterday started like a usual work day." Anna's voice: I was at work. And I wanted a break. So, I walked and walked … and walked. Then, I saw something! It was a festival -- a big festival! Anna: It is the Smithsonian Folklife Festival. Anna's voice: Yes. It was the Smithsonian Folklife Festival. Every year the festival shows different cultures. This year one of the cultures was the Basque culture. Anna: I am dancing a traditional Basque dance. Anna's voice: At the festival, I danced a traditional Basque dance! Anna: They are cooking traditional Basque food. Anna's voice: They cooked a lot of traditional Basque food. Anna: They are playing a game. It’s a kind of handball. What do they call it? They call it pilota! Anna's voice: They played a game with their hands and a small ball. It’s a kind of handball. But this game is called pilota. Anna: This is beautiful! This is traditional Basque art. Anna: They are making a traditional Basque ship. This festival is a lot of fun! Anna's voice: The whole day was a lot of fun! Anna: Who said that? I want to write my friends and tell them about my day! Anna: … So, I wanted to tell you about my day! Please, my friend, come visit Washington, D.C. soon. There is a lot to do! Until next time … Anna. Learn to pronounce the new words for this lesson. You also learn about the words people use in English when they cannot remember a word, or they do not know a word. 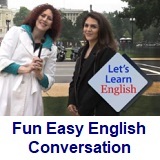 Use this video to learn about three ways to pronounce the past tense ending of regular verbs. said - v. past tense of the verb "say"
Tell about a party or festival in your town. Write about it in the Facebook Comments section below. Then practice using the past tense with a friend. Click lesson activity to get the printable PDF version. The page opens to a new window.